Hoverboards have redefined fun with their simple but incredibly powerful transport function. 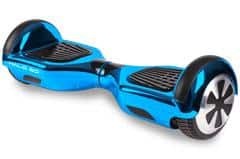 Many people who haven’t tried out a hoverboard before are often doubtful about safety and balance. But with the now enhanced top models like the new all terrain Halo Rover X, you can set your worries regarding safety aside and focus on having fun. This hoverboard has been meticulously designed with close attention to quality, safety, and capability. The hoverboard is manufactured by Halo Board, an established Los Angeles-based company that focuses on making dreams on wheels (and wings) come true. 1 What are the Halo Rover X features and functions? 6 How safe is it? 7 Halo Rover vs Halo Rover X vs Halo Go – Which Is Best? 8 Final verdict – Is it worth the purchase? What are the Halo Rover X features and functions? The strongest selling point of the upgraded model is its innovative and impressive line-up of features. The rover has a sprinkle of user efficiency and ease of use in every aspect of its features and design. The Bluetooth and mobile apps, for instance, are great features for users looking for more control and to add a little fun to the transportation function. It comes with an 800-watt dual motor that allows you to ride up the hills with relative ease. It also has a torque management system which makes sure that you have a smooth and nice ride at all times. It comes with its own app that can be used for GPS tracking as well as monitoring and regulating the speed, power and distance. Battery tracking ensures that you don’t get caught off-guard without power. Other than monitoring, you can also regulate steering which allows you to have a safe ride. The addition of a Bluetooth speaker is another unique and fun innovation on this rover. The speakers can be linked to a mobile device so you can enjoy some music as you ride the hoverboard. This rover comes with an LG 4.4AH/36V Lithium-ion Battery with a battery life of up to 2 hours of continues riding. The battery fully charges in about 2.5 hours and provides a riding distance of about 10 miles on a single charge. This is quite impressive considering that its closest competitors average about 7 miles of riding distance on a single charge. The robust, multipurpose 8.5-inch tires are designed to handle some of the harshest, off-road conditions with ease. The never-flat, all-terrain tires will grip over boulders and other obstacles with determination to get you to your next destination. The new Halo Rover X model now comes with aluminum protective wings which take the impact in the event of a fall protecting the body of your rover from damaging. If you intend to try out this rover’s capability on off-road trails during snowy or rainy conditions, there is absolutely nothing stopping you. The unit is designed to be water resistant with a rating of IPX4 which means it remains undamaged if it comes in contact with water. This is not only a cool feature but it also greatly contributes to the safety and efficiency of the unit. Ride-Assist Technology, when turned on, ensures that the hoverboard remains upright to keep you stabilized and minimize falls. There are also three training modes (Beginner, Normal and Advanced) which allow you to train like a pro when turned on. Tires – 8.5” all-terrain, robust, indestructible. Additional features – Carrying case, built-in speaker, Bluetooth, Mobile App. this is a robust, all-terrain, cool rover that hasn’t met its competing match in the market yet. The unit is suitable for users 7 years and above, and it’s quite easy to learn and operate. Being an all-terrain rover, you can ride in pretty much any condition including on streets, park trails, mud, sand and snow with equal ease. Thanks to the indestructibly built 8.5-inch tires, you will experience an exceptionally smooth ride regardless of whether your terrain is dry or wet. Aside from being shock absorbent, the tires are also incorporated with stability sensors to ensure that all rides are balanced. The unit can take a maximum weight of up to 265 pounds and can climb inclines of up to 20 degrees which should give you an idea of just how versatile this model is. Reliable large, all-terrain, never-flat tires. It comes to a near standstill if the battery cuts out. Definitely nothing that should put you off buying. 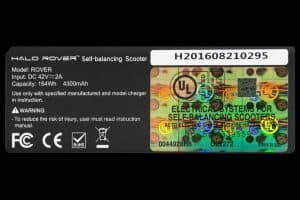 This hoverboard is completely safe to ride as it has received the UL certification which is approved by the US government. This essentially means that issues of malfunctioning and stories of overheating and batteries catching fire don’t apply here. Halo Board have made the entire unit IPX4 water resistant as well. On top of that, innovative technologies such as the rider-assistance and training modes minimize chances of falling while cruising your rover. Halo Rover vs Halo Rover X vs Halo Go – Which Is Best? These are all manufactured by the same company –Halo Board. The X is the newest model in the Halo Board line of rovers and is very comparable to its predecessors, i.e. Halo Rover and Halo Go. The hoverboards have similar capabilities with just some minor differences in functions and features. For instance, the Halo Rover X comes with a modified leg rest for enhanced stability and comfort. There is also an aluminium wheel protector instead of a plastic one seen on the previous models to prevent your unit from damaging during falls. Otherwise, they have the same features such Bluetooth and app compatibility, as well as all terrain features such as IPX 4 water resistance. Even the price is the same. One major difference though is that the new model does NOT come with a free carrying case while the original Halo Rover does. The Halo Go hoverboard falls a little behind in this group in terms of performance and features (this isn’t an off road hoverboard), but that doesn’t make it any less functional. 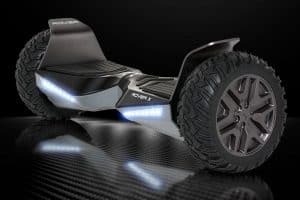 The Halo Go comes with 6.5” tires, rides for a distance of 8 miles on a single charge, 500-watt motor, speed of 9 mph, and doesn’t have Bluetooth speakers or mobile app. It’s also quite a bit cheaper though at just $297. Overall, even though the Halo Rover X emerges as slightly superior (but only really cosmetically), all the three Halo Rovers are designed with control, comfort, ease of use, excellent battery power and performance in mind. Final verdict – Is it worth the purchase? This new off road hoverboard takes all the worries and doubts of safety and balance of hoverboards out of the equation and presents a simple yet powerful all-terrain performance. 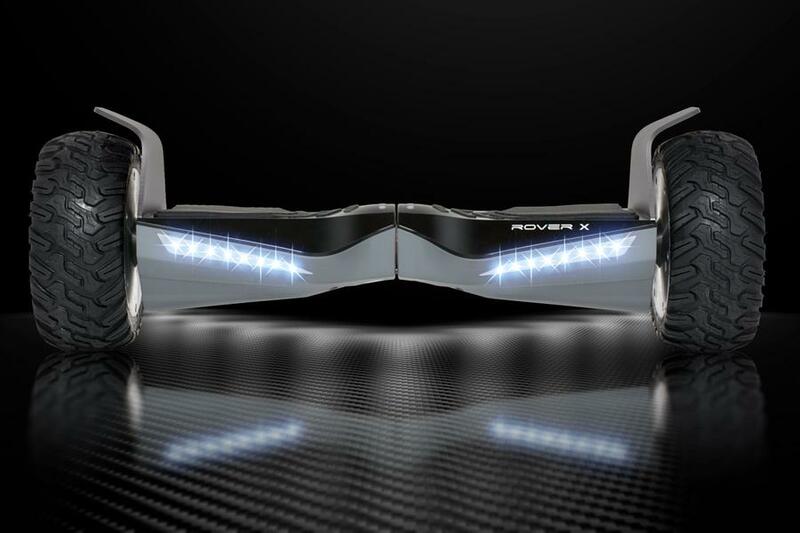 The self-balancing rover is also designed with close attention to stability, comfort, durability, and fun in mind. Now with cool features such as the Bluetooth speakers and mobile app, you can easily monitor and regulate things like speed, battery power, and ride modes as you blast some music during your cruise. All things taken into consideration, this new X model is every bit as good as the original Rover which we’ve rated as our no.1 choice of best off road hoverboard for 2018. When comparing the Halo Rover vs Halo Rover X though there really aren’t enough new features to make it a clear winner out of the two – both have almost entirely the same features and specifications and the only real differences are cosmetic ones. Both are priced the same, so if I had to choose I’d probably go for the original model just because it comes with a free carry case (worth $110). 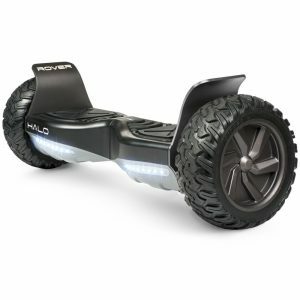 Either would be a great choice though if you’re looking for a high quality off road hoverboard. Don't Miss This Limited Offer: Get $50 OFF!